We noted last month that Qik’s Video Camera app had disappeared form the App Store with little public acknowledgement. After weeks of silence from Qik, the company has reposted its Video Camera app on the App Store—sort of. The revised app comes with several new abilities. With the previous app, recording a video while overlaying effects would almost always leave the video and audio out of sync, so good news: a fix means you no longer have to watch your videos as if you’re watching a badly-dubbed kung fu flick. The app also now lets you pause a video recording. This saves having to stop and start a new recording, which could result in you missing a video-worthy moment. Another new feature Qik touts is PhotoMix, which allows you to combine an image from your photo gallery with your recording. When you choose an item from your iPhone’s camera roll, you can erase a selection of the picture and fill that gap with video you record. While this may lets you produce all sorts of fun videos with your iPhone, you won’t fool anyone: the overlay isn’t completely opaque, so you can still see a faint image of your recording behind the rest of the image. Qik Video Camera Pro also sports much improved sharing options. You can now upload your videos to your account at Qik, share the links via SMS, or Twitter, or post them to YouTube or Facebook. 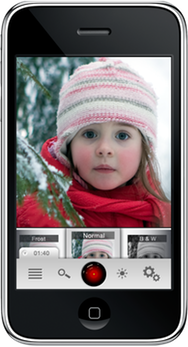 Using Qik-in-touch, you can also manage your videos in your iPhone via the Web. Unfortunately, some features from the earlier version are missing in the new app. For example, the older app let you preview effects on top of the actual capture; Qik has now moved previews from the app's nice large viewfinder to tiny barely-watchable previews above the toolbar. It works, but it’s very inconvenient. Qik Video Camera Pro normally costs $2, though it's currently available for free. It requires an iPhone running iPhone OS 3.1 or later.